"the new player is in town"
The industrial sampler for continuous monitoring for the most demanding applications. Suitable for the most aggressive sample liquids. Ideal as the basis for determining waste water costs within industrial parks. With self-emptying and 2nd bottle level. 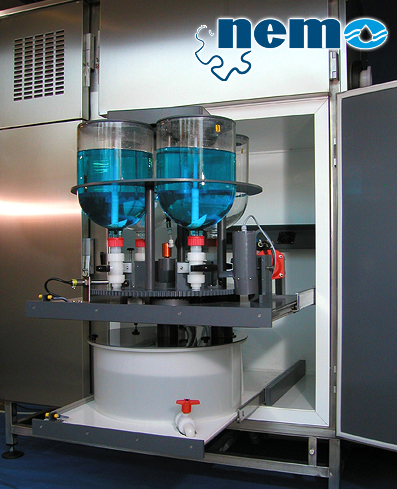 Optional with integrated stirring system, ultrasonic level control of the sample bottles, air rinse of the sample chamber. Stainless steel housing frame with PVC insertion technology. With foamed evaporator plate. Optionally, all sample-contacting parts can be made of PVDF material. Suitable for use in explosive atmospheres acc. To ATEX II 2G IIB T4. Equipped with the NeMo control, this sampling system offers remote control via internet technology, e-mail function, intelligent data archiving and an alarm system. Epoxy coating of all stainless steel parts inside of the sampler cabinet as e.g. cooling chamber and bucket elevator pump.